Jessie Zhan’s research interests include work stress and well-being, emotion and emotion regulation at work, and retirement. In one area of her research, she studies work stress and well-being of employees in service positions (i.e., "people work"). Her research examines the triggers of service employees' work stress, such as mistreatment from customers and organizations' emotional demands, as well as service employees' affective, cognitive, and behavioral reactions to these stressors. In another area of her research, she examines the psychology of retirement process. Her research aims to contribute to the understanding of older employees' retirement planning and decision-making, their adjustment to post-retirement life, and retirees' health and well-being. 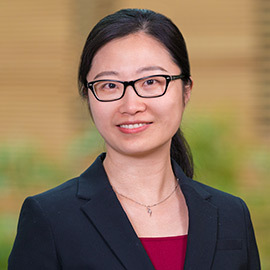 Zhan’s research has been published at academic journals including Academy of Management Journal, Journal of Applied Psychology, Personnel Psychology, Journal of Organizational Behavior, and Journal of Occupational Health Psychology. Garden, R., Hu, X., Zhan, Y., & Yao, X. (in press). Popularity Procurement and Pay Off: Antecedents and Consequences of Popularity in the Workplace. Journal of Business and Psychology. Zhan, Y. (2016). Blended work: Further connecting to the broader bridge employment literature. Work, Aging and Retirement, 2, 390-395. Zhan, Y., Wang, M., & Shi, J. (2016). Interpersonal process of emotional labor: The role of negative and positive customer treatment. Personnel Psychology, 69, 525-557. Zhan, Y., Wang, M., & Shi, J. (2015). Retirees’ motivational orientations and bridge employment: Testing the moderating role of gender. Journal of Applied Psychology, 100, 1319-1331. Zhan, Y., Wang, M., & Yao, X. (2013). Domain specific effects of commitment on bridge employment decisions: The moderating role of economic stress. European Journal of Work and Organizational Psychology, 22, 362-375. Wang, M., Liao, H., Zhan, Y., & Shi, J. (2011). Daily customer mistreatment and employee sabotage against customers: Examining emotion and resource perspectives. Academy of Management Journal, 54, 312-334. Wang, M., Zhan, Y., McCune, E. A., & Truxillo, D. (2011). Understanding newcomers’ adaptabilities and work-related outcomes: Testing the mediating roles of perceived P-E fit variables. Personnel Psychology, 64, 163-189. Wang, M., Liu, S., Zhan, Y., & Shi, J. (2010). Daily work-family conflict and alcohol use: Testing the cross-level moderation effects of peer drinking norms and social support. Journal of Applied Psychology, 95, 377-386. ﻿Zhan, Y., Wang, M., Liu, S., & Shultz, K. S. (2009). Bridge employment and retirees’ health: A longitudinal investigation. Journal of Occupational Health Psychology, 14, 374-389. Liu, S., Wang, M., Zhan, Y., & Shi, J. (2009). Daily work stress and alcohol use: Testing the cross-level moderation effects of neuroticism and job involvement. Personnel Psychology, 62, 575-597. Wang, M., Zhan, Y., Liu, S., & Shultz, K. S. (2008). Antecedents of bridge employment: A longitudinal investigation. Journal of Applied Psychology, 93, 818-830.